What an adventure I had the other day! 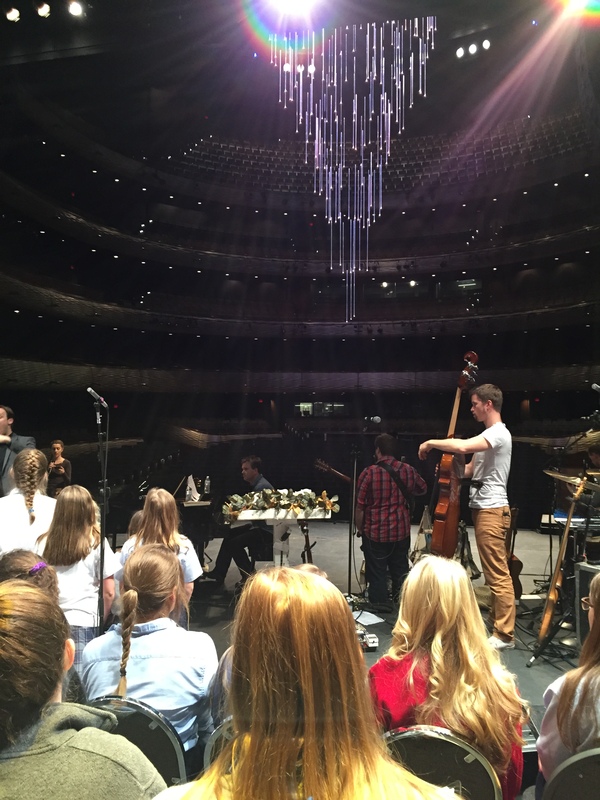 Our church choir was one of several invited to sing carols and background vocals for a group from Northern Ireland called The Gettys, performing at the Winspear Opera House located in the arts district of downtown Dallas. We were given the opportunity to attend one of two mandatory rehearsals if we intended to join the performance. The first was so fast paced it made our heads spin, doubly so for me since we were 15 minutes late, having had trouble finding our building on the campus. This put me behind in the ladies’ rehearsal which was scheduled first that day. Added to that was that everyone seemed to know about changes to the music that we’d never heard of. You know that dream where you end up in class in your pajamas or worse? That’s sure how I felt when the director started rattling off updates that were a total surprise, but everyone else already had them marked in their music. The lady next to me took mercy on me and attempted to indicate the updates as quickly and quietly as possible so I wouldn’t feel so lost. It seemed like she and I were the only second sopranos at this first rehearsal so I was very grateful for the help. When our time ended and the men’s rehearsal began, I discovered my kind section buddy arrived with the only two women I knew there. During our break I also found that there was a mailing list whereby the director sent us modifications to the music or program, so I signed up and the amount of material they sent us was mind-boggling. Never having performed in such a venue, I didn’t realize all the details that went into making all this go well, and never before had I felt so out of my depth. Deciding we both needed the extra rehearsal, my new friend and I braved it together the following Saturday. Thankfully, I was better prepared for the fast pace and ever-changing updates in what we would and would not sing, as well as all the updates to the arrangements. It was a fluid thing, a work in progress, at all times. Reminded me a bit of working at the bank for so many years, where you never knew when your job duties or managers would change, you just kind of went with the flow. By this time, my better half decided the pressure of learning all this music without having any buddies in the bass section was too much for him and opted to stay home and watch the Mavericks play on TV. After the second rehearsal, my friend Linda forwarded me the latest changes (yes, more changes) since some of us were left off the email. At this point, I was feeling a bit overwhelmed myself and was seriously considering dropping out as well. Folks who know me know I tend to be a Type A personality and since I’m taking a class this week that takes up a lot of my energy, I was wondering if this was going to be worth all the trouble. By Sunday night, I made my decision and told my friend I was not going to join them. We met for our dress rehearsal at 4:30 pm at the Winspear and that place is just awesome. Luckily we were there early enough to take loads of pictures before going in. The rehearsal was handled expertly by our rehearsing director and by the choir director that tours as a part of the Gettys’ band. Even at the rehearsal, all the band members and director were full of enthusiasm and put so much fun into their performance, while remaining totally professional at all times. It took me a while to realize that Keith Getty was playing the piano for us the whole time, until he stopped a moment to change something in our performance. During our break, we all by tacit agreement met in small groups to go over trouble spots as well as our memorization numbers. Everyone worked so well together. Keith Getty came in just before we were to take the stage to give us a pep talk. Very thoughtful. The performance itself was wonderful. I really love Irish music and this Irish Christmas performance was no exception. The band and dancers were flawless, our choir director was fantastic and we had absolutely no trouble following him. Kristyn Getty’s voice was just lovely, and it was a pretty magical evening. No regrets, just wonderful memories. On a side note, as we traveled home, I wasn’t paying attention to where we went, until I realized we found ourselves in the West End. My friend’s friend was driving and as he turned left to get us back on track, we suddenly found ourselves heading into oncoming traffic with four lanes of headlights coming straight for us. Okay, not his fault, since the road we came off of gave us no warning. Also, no judgment here since this was not my first oncoming-traffic-wrong-way-rodeo. And as my cousins well know, at this point, had I been driving, I would have said “I’m so sorry and I’ll never do it again!” (They won’t let me forget this.) Luckily our driver had quick reactions and infinite patience with all our back seat and side seat “helpful” directions at this point and had us quickly out of danger’s path. 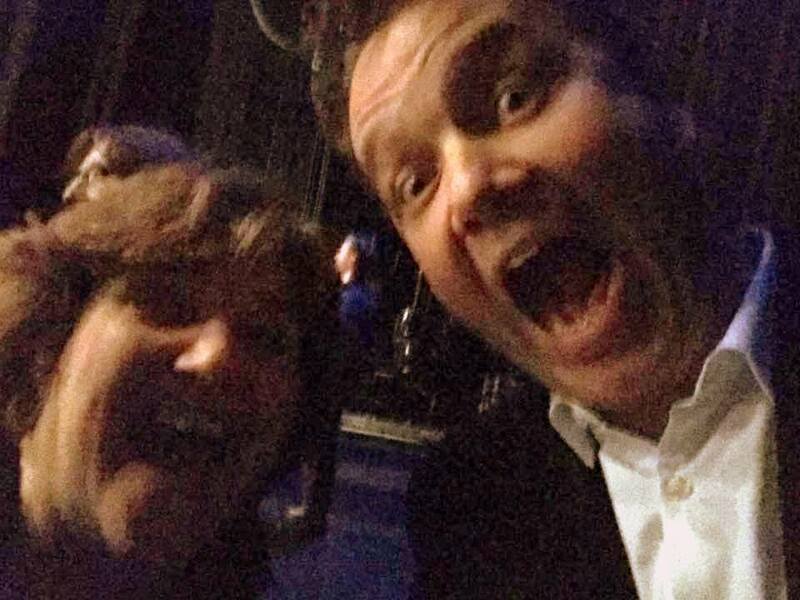 My Selfie with Keith Getty backstage after the performance. This entry was posted in Journal Post and tagged Being a friend, Blog, Blog post, Christmas, church, concerts, friends, Head on traffic, Irish Music, Journal, Music, The Gettys, Winspear, Winspear Opera House. Bookmark the permalink. I enjoyed your story! Not so sure everyone in my family would label me as Type B, however!! But in this case I knew from the start I was in over my head musically, but I also knew it would be a fun experience. Thanks, Linda! I am so glad you talked me into doing this.